Dragonów Apartments is an unusual and distinctive investment in Olsztyn. Mainly because of the unique location among the historic buildings of the former municipal slaughterhouse, which at the time of the investment will be restored and converted to industrial service lofts. 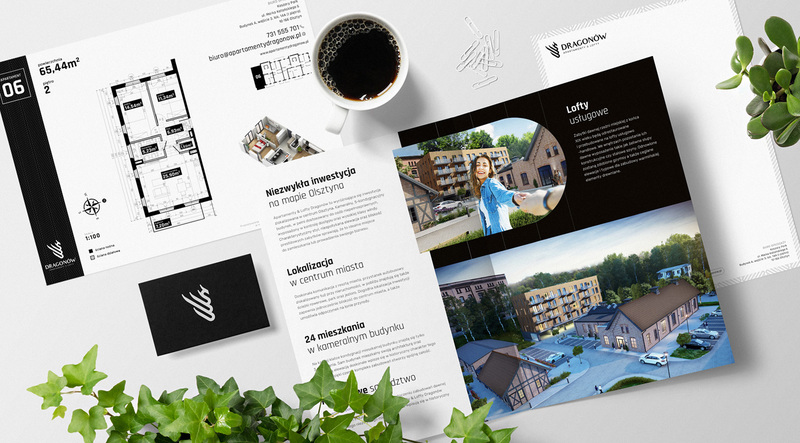 At the developer’s request for this characteristic investment, we have developed a logotype and other elements of visual identity, printed materials and outdoor advertising. 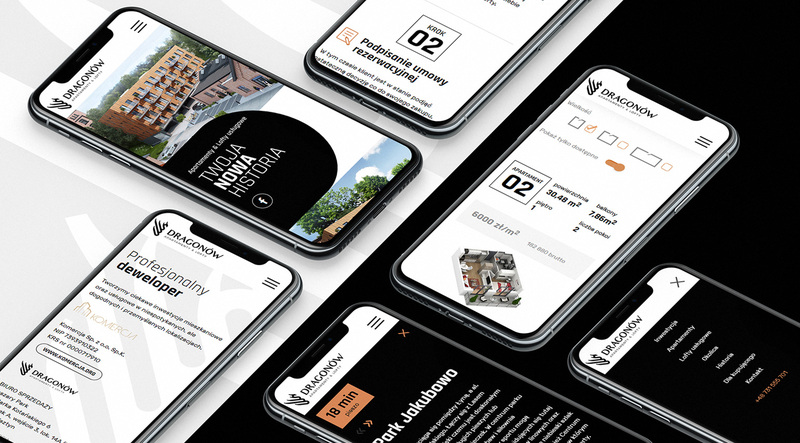 We also dealt with the creation of a website and materials presented on it, ie technical cards for apartments and service lofts. Our work began with the development of an investment logo. 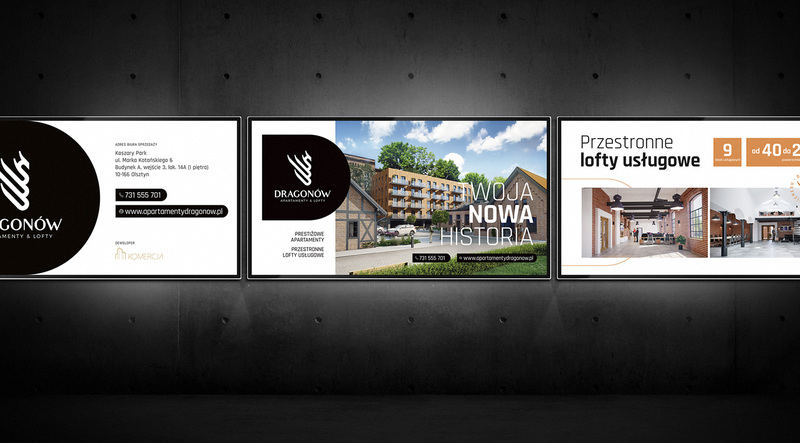 We have prepared 3 different proposals, each of which took into account the location of the investment in the historic Olsztyn location and its name “Apartamenty & Lofty Dragówów”. The logotype chosen by the client is characterized by an interesting and original signet ring based on the shape of the dragon. The signet is closed in a few simple lines, thanks to which it fits in well with the rest of the logo – it does not overwhelm it and it interacts with the selected font. We chose the sans-serif typeface, which is aesthetic, modern and subtle. With the development of the logo, we also designed other materials related to the visual identification of the brand – business cards, company paper and elements of the sales office decor. Another element of our work was to design and implement a website for this residential investment. We started our activities by developing a site map, presenting its structure and functions to the client. Then we created the content for the site, based on the previously prepared construction of individual subpages. The next step was to create a website graphic design that is consistent with key visual. The site has implemented features such as an overview of the list of available premises along with the search engine. Due to the fact that it is a cozy investment with 24 apartments in sale, the search engine is not expanded. It is based mainly on the area of ? ?each apartment and its availability. However, even such a simple method of filtering allows the user to familiarize with apartments adapted to his requirements in an intuitive way. The website is based on WordPress and fully adapted to mobile devices. Thanks to the administration panel, the client can independently manage the list of apartments – update it and edit it in such a way that the website always displays up-to-date information on sold and booked apartments. We have supported our client with the development of printed materials. The main element on which the greatest emphasis was placed was the advertising folder with basic information about the investment. We dealt with the creation of substantive content and the development of the graphic design of the folder. In addition to the folder, we also created offer folders and notepads. As part of our work, we coordinated the printout of all materials. We also took care of the coordination of activities related to the development of 3D visualization for each apartment. 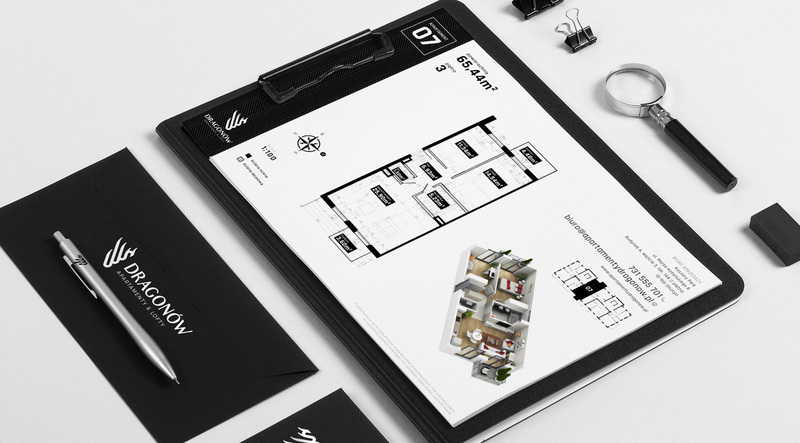 Having professionally made visualizations, we were able to use them to create branded technical cards for apartments and commercial premises. The technical sheets contain basic information about the premises. They are available for download from the website, but they also serve as an information during the sales process at the investment sales office. Comprehensive implementation of all activities for the client from the creation of a branding, through the website, to all kinds of advertising materials, ended with the design of outdoor banners that were used at the place of the investment. As part of our work, we have also developed a flag design with an investment logo, which is also a visible advertising medium.